A federal judge who last year ordered the government to reunify 2,814 migrant children with their parents said Thursday that job is nearly done, clearing the way for the Trump administration to begin identifying thousands of other families that were separated even before the government announced its "zero tolerance" policy at the border. “That’s basically right,” responded Lee Gelernt, an attorney with the American Civil Liberties Union who is representing the families. Last year, Sabraw ordered the government to reunify children who were in custody as of June 26, 2018, with their parents. Since then most children have been released to a relative or foster home. Only 54 children are still awaiting release. But in January the inspector general for the Department of Health and Human Services determined that "thousands of children may have been separated during an influx that began in 2017, before the accounting required by the court." The report found that officials with the Office of Refugee Resettlement, the agency responsible for caring for unaccompanied migrant children, estimated that thousands of children who passed through shelters since 2017 had been separated from a parent. However, because there was no integrated system for tracking separated families across government agencies, the total number and status of the children was unknown. On Thursday, Sabraw ordered the government to submit by April 5 a detailed plan of how it would go about identifying those separated children and who would lead the effort. “We’re moving that forward,” U.S. Attorney Scott Stewart replied. He explained that the planning would involve several government agencies in a time-consuming process. Sabraw ruled that those families should be included in the current class action lawsuit challenging the legality of the separations and may be entitled to relief. Another issue Sabraw hoped to see resolved soon is the creation of standardized data for tracking family separations in the future, more objective and uniform criteria for determining when it's legal to separate a child from a parent and a protocol for reunifying families. 54 children are still awaiting release to relatives or foster homes. 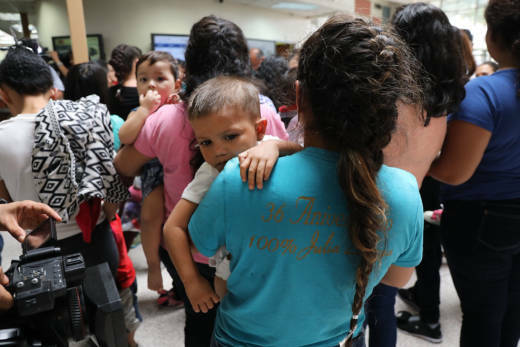 Of them, 21 children were denied reunification with parents immigration officials deemed “unfit” or “ineligible” and 33 were not reunified with parents who waived that right.